This article originally appeared on the Feed the Future Innovation Lab for Assets and Market Access website. 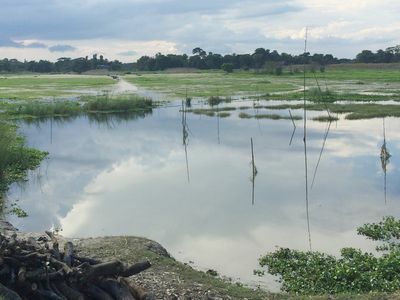 Flooding is a constant threat in many parts of Bangladesh where people’s livelihoods depend on a good crop. Microinsurance was designed to help at-risk farmers to increase their resilience to this threat, but existing products have suffered from low demand. New research shows that an innovative loan product may provide an alternative that provides many of the same benefits as insurance. The idea is an emergency loan that triggers in the event of a catastrophic flood as a tool for farmers to manage risk. Numerous studies have found that when farmers have better tools to manage risk, they tend to invest more in their productivity, which leads to higher incomes and assets over time. In this way, the emergency loan works a lot like index insurance but without payments up-front. Sadoulet is leading a Feed the Future Innovation Lab for Assets and Market Access randomized controlled trial (RCT) to measure the impacts of an emergency loan for BRAC clients in Bangladesh. The idea for a microloan that functions like index insurance came up in 2012 during a discussion between Sadoulet, UC Berkeley economist Alain de Janvry and the late Mahabub Hossain, the agricultural and development economist and past executive director of BRAC. Later that year, de Janvry gave a presentation to BRAC in Bangladesh on keeping insurance for extreme events while using flexible credit for more normal risk. The idea caught on. In 2015, BRAC piloted the emergency loan product in 15 BRAC branches in six flood-prone regions of Bangladesh. “The emergency loan takes a lot from index insurance in the sense that you know you are eligible ahead of time and it is triggered by a weather index that doesn’t ask the lender to go and verify anything,” says Sadoulet. The first flood hit in the first year. Between September and November, BRAC disbursed 271 emergency loans. A year later, BRAC reported that over half of the clients who accepted the loan were repaying ahead of schedule. They also found a 5 percent increase in savings among the emergency loan borrowers, compared to just 1 percent for non-borrowers. In 2016, BRAC expanded the experiment to 200 branches. To date, they have disbursed over 1,400 emergency loans triggered by floods. Results from the AMA Innovation Lab RCT show that those loans have had a big effect on how these farmers manage risk. Households who knew they were pre-qualified planted about 25 percent more rice than households who were not offered the emergency loan. Households who did not suffer any flood losses produced about 33 percent more from their crops. “Just letting people know they have guaranteed access to credit does make them feel like this risk is covered, leading to the same mechanisms as have been found with microinsurance,” says Gregory Lane, a Ph.D. candidate in economics at UC Berkeley who has worked closely with BRAC to further define, implement and evaluate the emergency loan program. “All they have to do is say, ‘Yes, I understand,’ and they’re treated,” he adds. But the microloans also benefitted households who lost their crops to flooding. An early analysis of the data suggests that average consumption and assets are both higher after flooding compared to households not provided access to the loan. The most common way these households used the emergency loan was to plant a short-duration crop, like vegetables. They could bring these crops to market quickly for a chance to salvage part of their income for the year. The alternative is often cutting meals or selling assets they would use to generate future income. While this kind of microloan is promising, says Sadoulet, it still has limitations. These emergency loans work as a commercial product in part because BRAC hand-picks clients who have a strong history of repayment. Also, two bad years in a row would make it hard for households to repay a loan from the first bad year. Alex Russell manages communications for the Feed the Future Innovation Lab for Assets and Market Access at University of California, Davis. Learn more about its research activities and sign up for monthly updates at basis.ucdavis.edu.